Background: Changes in structure may affect outcome after intensive care in various ways. Both closed (as opposed to open) units and the number of nurses have been shown to affect outcome. Objective: To study the effects of temporarily moving an intensive care unit (ICU) on various indicators of outcome and quality of care. Methods: Because of rebuilding, over a period of 8 months our ICU was moved to an adjacent postoperative area. The 12 month periods immediately before and after the rebuilding were chosen as reference periods. Routinely collected data such as length of stay, ventilator time, readmission rate, severity score (SAPS II), and observed mortality were used for comparison. Results: Using variable life adjusted display (VLAD), an increase in hospital mortality was observed during the 8 month rebuilding period. This was also found using Kaplan-Meier estimates of survival and standardised mortality ratio. Conclusion: Structural change to our ICU was probably the major cause for the observed change in mortality. Changes in structure may affect outcome in various ways. In intensive care, the change from an open to a closed unit—that is, with dedicated doctors in charge of the unit—has an impact on mortality.1,2 Other factors, such as the number of intensive care nurses,3,4 workload,5 and availability of relevant equipment,6 have also been shown to affect outcome. Data on the impact of temporarily moving an intensive care unit (ICU) from one place to another within the hospital have not been found. In 2001/2 our ICU was totally rebuilt and it was necessary to move to a temporary area for 8 months in order to provide intensive care facilities. The possible effects of this change of locality were investigated retrospectively and are reported here. The primary objective was to analyse short and long term mortality data using standardised mortality ratios (SMR), Kaplan-Meier survival analysis, and variable life adjusted display (VLAD). The study was performed in a mixed 10 bed, closed ICU in a 900 bed Norwegian university hospital. Intensivists run the ICU with an average nurse to patient ratio of 1:1. The average number of admissions is 400–450 per year, and the average SAPS II severity score in the years 1999–2003 was 43.5 associated with a 19% mortality rate in the ICU and 29% hospital mortality rate. The unit is well equipped and cares for all types of patients with the exception of those with burns and following organ transplantation. Within the hospital there is a separate post-cardiac surgery ICU, a cardiac care unit, and a special burns unit with an ICU. The hospital was built in 1983 and in 2000 we started planning a major rebuild of the ICU within the confines of the existing unit. This included a new electric power supply, new sterile water delivery for haemodialysis, a new reception area, new patient rooms with new design, an isolation area with subatmospheric pressure, and ceiling mounted equipment arms. It was not possible to continue activity in the unit during the rebuilding period, so a temporary move was made to an adjacent area—one of the postoperative units with seven monitored beds. We moved out in June 2001 and returned to the new ICU 8 months later in February 2002. No other major changes occurred during this period; staffing of nurses and physicians remained the same (quantity and quality). No major revision of treatment policy was introduced during this period. One year after moving back to the new unit we decided to analyse the effects of moving to another area for 8 months using mortality and various quality measures routinely observed and documented as described above. For comparison, we used two 12 month periods, one immediately before (June 2000 to May 2001) and one after the 8 month period (February 2002 to January 2003). Statistical process control charts were used to evaluate ventilator time and length of stay as previously described.12 The readmission rate and reported adverse events were also analysed, as well as mortality data with the SMR using the calculated SAPS hospital mortality as the denominator.8 The number of cases of ventilator associated pneumonia (VAP) were analysed to reveal any changes in infectious morbidity during the periods. The VLAD technique was used to highlight changes during this period.13 For this, the individual SAPS II estimated probability of dying in the hospital (pmortality) was added for each survivor, and (1 – pmortality) was subtracted for each patient dying during the hospital stay. The crude number of admissions with demographic data, length of stay, ventilator time, SAPS II score, and mortality data are shown in table 1. There were no obvious differences in severity of illness, age distribution, or resource use such as the length of stay or ventilator time between these three periods. Run charts of length of stay, ventilator time, and reported adverse events give values within 3 SD limits for all three periods, with no obvious changes during the rebuilding period. No changes were recorded in the frequency of VAP (table 1). The SAPS II intake criteria were also similar, with only minor changes occurring in the 12 month period after rebuilding. The number of hospital deaths increased from 96/411 (23.4%) before rebuilding to 84/259 (32.4%) during the rebuilding (difference 9%, 95% CI from 2 to 16). Correspondingly, the SMR increased from the period before to during rebuilding, and was still increased in the period after (differences within the 95% CI limits). Figure 1 shows the VLAD in the three periods studied. The change in performance during the 8 month rebuilding period is clear. The variation is still there, but the trend during this period is negative compared with the two other periods, corresponding to an SMR slightly above 1 (table 1). 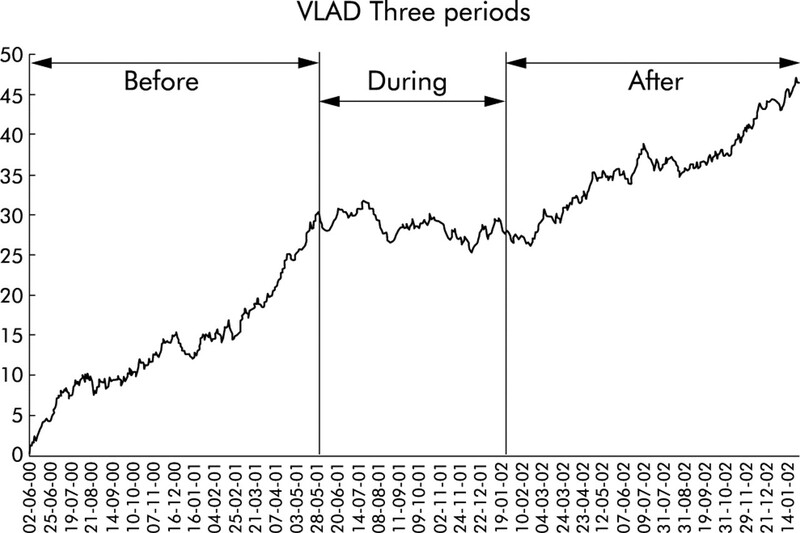 Variable life adjusted display (VLAD) for the three study periods: before (12 months), during (8 months), and after (12 months) rebuilding of the intensive care unit. 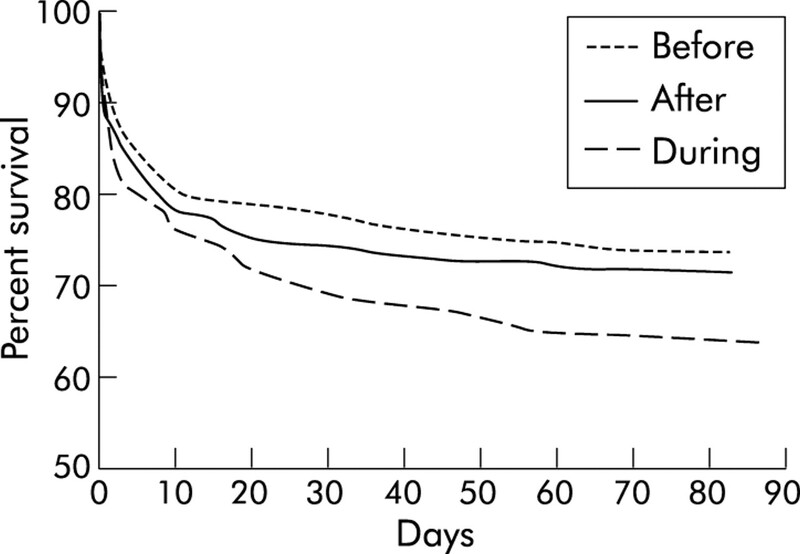 Figure 2 shows the 90 day Kaplan-Meier estimates of survival from admission to the ICU; it can also be seen that the cohort of patients treated during the period of rebuilding follows a different path from that of the cohorts 12 months before and after this period. The log rank test for curve trend is significantly different (p = 0.0468) and the increased mortality rate continues throughout the whole 90 day period. Kaplan-Meier survival estimates of the three cohorts studied: before, during and after moving out of the intensive care unit (ICU). Mortality is calculated from admittance to the ICU. Table 2 shows the readmission rate in the three periods. The overall readmission rate (defined as readmission during the following 3 months) is very similar, but the readmission rate within 72 hours differs, with a higher frequency during the period of rebuilding. In this analysis of the performance and outcome in our ICU during a period of rebuilding, we found a marked reduction in survival rate compared with the 12 month periods before and after rebuilding. This change in survival is most obvious in the VLAD curve using the expected mortality rate from the individual SAPS II scores, but is also shown by an increased SMR and reduction in the 90 day Kaplan-Meier survival curves. The reasons for the temporary worse outcome for the intensive care patients are not clear. The patients were from the same geographical area (since we still functioned in the same hospital), and the severity of illness did not change. Other case mix differences could not be found, and the mean age of the patients was approximately the same. We found no differences in length of stay in the ICU or in ventilator time between the three periods, the reporting of adverse events did not change, and the frequency of VAP was approximately the same. The only “positive” finding was an increased readmission rate within 72 hours, and the median time for readmission decreased from 5 to 3 days. Several team members have retrospectively mentioned observing an increased number of confused and agitated patients during the period of rebuilding. This observation was not possible to document because of the lack of a standard definition and reporting of confusion in our ICU. The major difference was the organisation of the unit—a temporary unit set up in a nearby postoperative area. This area consisted of one large room with six monitored beds and one single room, in contrast to the four single and three double rooms in the original unit. The distance to the storage area was considerably increased, as was the distance to the offices, rooms for reporting, rooms for relatives, and pausing facilities. There is no learning curve with time; in fact, the results deteriorated continuously during the period of rebuilding (fig 1). After moving back to the new ICU the situation improved after a period of approximately 2 months. In spite of this, the results for the first 12 months after moving back did not reach the same standard as in the original unit. Only in the second 12 month period after moving back (February 2003 to January 2004) did the outcome return to normal with an SMR of 0.66 (data not shown). This change in outcome was not apparent to us until we used the VLAD technique to analyse performance. Since the 8 month period of rebuilding took place over two separate years, it was not obvious from the standard yearly reporting that this period was different from the normal performance for our ICU. VLAD is a technique used in many different clinical settings, but it has been particularly used to evaluate cardiology and cardiac surgery units13,14 to have early monitoring of variation in outcome. The VLAD technique can be used to illustrate the cumulative outcome for a hospital, a single unit, or an individual doctor (usually surgeons). If performance is measured against a standard (expected mortality), the curve will vary around zero if the observed mortality is as expected; it will rise if better and fall if worse than the standard. Although it is difficult to perform statistical analysis on such a graph, the visual impression is perhaps the more important one. The major difference in SMR and VLAD is the element of time. The VLAD technique displays outcome along a time axis and hence is more sensitive to changes over time. Other methods are also used to perform risk adjusted monitoring over time.15 The SMR, on the other hand, aggregates mortality data in a defined period and does not reveal changes within that time period. The limits of this observational study are many. The 8 month period was probably too short for our unit to adapt to the new situation. If more patients had been treated in the temporary ICU, this would have strengthened the differences observed. We also have no information on the cause of death of the patients after leaving the unit. More detailed data on infectious complications and on confusion and psychosis were impossible to retrieve using the retrospective approach. The whole experience could also be an extreme variation happening by chance, although the probability for a spontaneous change as illustrated in the VLAD curve must be very small. However, we cannot rule out the possibility that this was a negative consequence of moving to a temporary area not intended to be used as an ICU. If so, it is a remarkable effect of a sudden change in structure on patient outcome after intensive care. The lesson to learn from this study is that sudden structural changes may have an unexpected effect on an anticipated normal outcome. It is probably wise to anticipate a change, and to set up a prospective registration of outcome data of interest. In intensive care, in addition to mortality data, this should include time chart analysis of length of stay and time on ventilator, specific complications (such as nosocomial infections), and behavioural changes in the patient population. The use of the VLAD technique is an easy way to perform continuous monitoring of risk adjusted mortality; it should be started before the changes in order to create baseline values and continue throughout the period of change. Any deviation should lead to prompt investigation to find correctable reasons for a suboptimal performance. Multz AS, Chalfin DB, Samson IM, et al. A “closed” medical intensive care unit (MICU) improves resource utilization when compared with an “open” MICU. Am J Respir Crit Care Med 1998;157:1468–73. Pronovost PJ, Angus DC, Dorman T, et al. Physician staffing patterns and clinical outcomes in critically ill patients: a systematic review. JAMA 2002;288:2151–62. Dang D, Johantgen ME, Pronovost PJ, et al. Postoperative complications: does intensive care unit staff nursing make a difference? Heart Lung 2002;31:219–28. Moreno R, Reis Miranda D. Nursing staff in intensive care in Europe: the mismatch between planning and practice. Chest1998;113:752–8. Tarnow-Mordi WO, Hau C, Warden A, et al. Hospital mortality in relation to staff workload: a 4-year study in an adult intensive-care unit. Lancet 2000;356:185–9. Bastos PG, Knaus WA, Zimmerman JE, et al. The importance of technology for achieving superior outcomes from intensive care. Brazil APACHE III Study Group. Intensive Care Med 1996;22:664–9. Austlid I, Flaatten H. REGINA: developement of a database concept in intensive care medicine. Acta Anesthesiol Scand1997;41 (Suppl 110) :193. Le Gall J, Lemeshow S, Saulnier F. A new simplified acute physiology score (SAPS II) based on a European/North American multicenter study. JAMA1993;270:2957–63. Miranda R, Moreno R, Iapichino G. Nine equivalent of nursing manpower use score (NEMS). Intensive Care Med1997;23:760–5. Vincent J, Moreno R, Takala J, et al. The SOFA (Sepsis-related Organ Failure Assessment) score to describe organ dysfunction/failure. Intensive Care Med 1996;22:707–10. Flaatten H, Hevroy O. Errors in the intensive care unit (ICU). Experiences with an anonymous registration. Acta Anaesthesiol Scand1999;43:614–7. Brattebo G, Hofoss D, Flaatten H, et al. Effect of a scoring system and protocol for sedation on duration of patients’ need for ventilator support in a surgical intensive care unit. BMJ 2002;324:1386–9. Lovegrove J, Valencia O, Treasure T, et al. Monitoring the results of cardiac surgery by variable life-adjusted display. Lancet 1997;350:1128–30. Lawrance RA, Dorsch MF, Sapsford RJ, et al. Use of cumulative mortality data in patients with acute myocardial infarction for early detection of variation in clinical practice: observational study. BMJ 2001;323:324–7. Steiner S, RJC, Farewell V. Risk-adjusted monitoring of binary surgical outcomes. Med Decis Making2001;21:163–9.